What is IBM Clinical Development? IBM Clinical Development is a global cloud-based electronic data capture (EDC) platform designed to improve the way clinical research in the life-sciences area of study is done. It offers users with end-to-end visibility into their clinical trial data with a robust patient, site, and trial data management feature set and capabilities. Users can tailor and scale IBM Clinical Development both feature and function, allowing users to tailor the platform based on their requirements, the stage of their clinical trials, and other things regardless of phase or size. With electronic data capture (EDC) as its core component, IBM Clinical Development helps unify and structure crucial trial details, and provide users with immediate access to all study data from any web-enabled device. 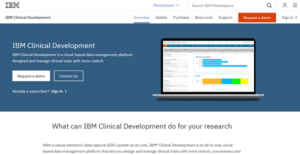 IBM Clinical Development presents you and your clinical research team/department with a rich cloud-based electronic data capture (EDC) and data management solution that lets you create the framework of your clinical trials and manage all data, phases, and other processes with a lot of control, convenience and confidence. Being a SaaS offering, IBM Clinical Development doesn’t need any special infrastructure or prior programming experience to use. It is built with intuitiveness and ease of use in mind, allowing you and other members to effortlessly access and navigate all your study data and platform functions via a unified, password-shielded online interface. IBM Clinical Development Electronic Data Capture allows you to build, design, and administer your trial eCRF in a matter of days. With the help from IBM support and services team, executing your research, implementing your trials, gathering and documenting results and other data becomes a breeze. If you want to incorporate existing data from other sources into your study, you can easily do that with IBM Clinical Development. The software comes with a data migration module that allows you to efficiently move your current data to IBM Clinical Development platform effortlessly. When you need reports, IBM Clinical Development lets you generate on-demand reports on the fly. Whether it’s a progress report or historical rundown, you can export it virtually any format, such as SAS, XML, CSV and Microsoft Excel. If you are considering IBM Clinical Development it might also be sensible to examine other subcategories of Best Clinical Trial Management Software listed in our database of B2B software reviews. Every enterprise has its own characteristics, and may call for a special Clinical Trial Management Software solution that will be adjusted to their company size, type of clients and staff and even specific industry they cater to. It's not wise to count on getting an ideal software that is going to work for each business regardless of their history is. It may be a good idea to read a few IBM Clinical Development reviews first and even then you should keep in mind what the solution is supposed to do for your business and your workers. Do you need an easy and intuitive solution with just basic features? Will you really make use of the advanced functionalities required by experts and big enterprises? Are there any specific tools that are especially useful for the industry you work in? If you ask yourself these questions it will be much easier to find a solid solution that will fit your budget. How Much Does IBM Clinical Development Cost? Contact IBM for more information on IBM Clinical Development, its basic and enterprise pricing packages, and more. You can also submit a request for a demo to see if its a perfect fit for your business. We realize that when you make a decision to buy Clinical Trial Management Software it’s important not only to see how experts evaluate it in their reviews, but also to find out if the real people and companies that buy it are actually satisfied with the product. That’s why we’ve created our behavior-based Customer Satisfaction Algorithm™ that gathers customer reviews, comments and IBM Clinical Development reviews across a wide range of social media sites. The data is then presented in an easy to digest form showing how many people had positive and negative experience with IBM Clinical Development. With that information at hand you should be equipped to make an informed buying decision that you won’t regret. What are IBM Clinical Development pricing details? What integrations are available for IBM Clinical Development?